Enjoy your holidays by visiting the best water and theme parks on the island of Tenerife. Tenerife has several aquatic, theme and zoo parks where you might have lots of fun during your holidays. You’ll find aquatic and theme parks throughout the island, both on north and south. Among its parks we highlight the Siam Park, in Costa Adeje, considered the biggest aquatic park in Europe, the Loro Parque, located near Puerto de La Cruz, Pueblo Chico, localized in La Orotava, and Las Águilas Jungle Park, in Arona. Description: An excelent aquatic park ideal for some refreshment and a fun on the most warm days. Description: A stupendous botanic and zoo garden where you might find many animals and exotic plants. Description: Fun park dedicated to the animal in danger of extinction reproduction. 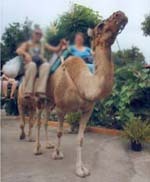 Description: In this park you might enjoy a camel ride through a thrilling trail. You’ll also be able to see a typical canary islands’ farm. 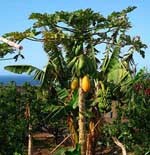 Description: It offers you a good sample of the different crops grown in the Canary Islands, paying special attention to the canary islands’ banana. Description: This theme park is specialized in plants and houses more than four hundred species of orchids from all over the world as well as a great collection of carnivorous plants.